Last updated 6:57 p.m. ET. Opponents of Mahmoud Ahmadinejad clashed with police in the heart of Iran's capital Saturday, pelting them with rocks and setting fires in the worst unrest in Tehran in a decade. They accused the hard-line president of using fraud to steal election victory from his reformist rival. Young people are especially angered by what they believe to be a rigged election, reports CBS News correspondent Elizabeth Palmer. The brazen and angry confrontations  including stunning scenes of masked rioters tangling with black-clad police  pushed the self-styled reformist movement closer to a possible moment of truth: Whether to continue defying Iran's powerful security forces or, as they often have before, retreat into quiet dismay and frustration over losing more ground to the Islamic establishment. But for at least one day, the tone and tactics were more combative than at any time since authorities put down student-led protests in 1999. 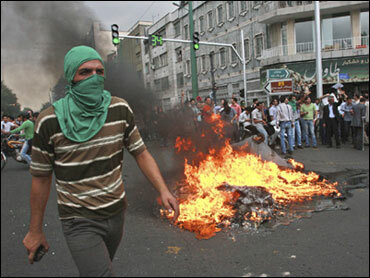 Young men hurled stones and bottles at anti-riot units and mocked Ahmadinejad as an illegitimate leader. The reformists' new hero, Mir Hossein Mousavi, declared himself the true winner of Friday's presidential race and urged backers to resist a government based on "lies and dictatorship." Authorities, too, pushed back with ominous measures apparently seeking to undercut liberal voices: jamming text messages, blocking pro-Mousavi Web sites and Facebook and cutting off mobile phones in Tehran. The extent of possible casualties and detentions was not immediately clear. Police stormed the headquarters of Iran's largest reformist party, the Islamic Iran Participation Front, and arrested several top reformist leaders, said political activists close to the party.The activists spoke on condition of anonymity because of the sensitivity of the situation. Mousavi did not appear in public, but warned in a Web message: "People won't respect those who take power through fraud." Many backers took this call to the streets. Thousands of protesters  mostly young men  roamed through Tehran looking for a fight with police and setting trash bins and tires ablaze. Pillars of black smoke rose among the mustard-colored apartment blocks and office buildings in central Tehran. In one side road, an empty bus was engulfed in flames. Police fought back with clubs, including mobile squads on motorcycles swinging truncheons. The scuffles began when protesters gathered hours outside the Interior Ministry around the time officials announced the final election results showing a nearly 2-to-1 landslide for Ahmadinejad. Demonstrators chanted "the government lied" and waved the ribbons of Mousavi's "green" movement  the signature color of his youth-driven campaign. "I won't surrender to this manipulation," said a statement on Mousavi's Web site. "The outcome of what we've seen from the performance of officials ... is nothing but shaking the pillars of the Islamic Republic of Iran's sacred system and governance of lies and dictatorship." The door for possible compromise was closed by Iran's supreme leader, Ayatollah Ali Khamenei. He could have used his near-limitless powers to intervene in the election dispute. But, in a message on state TV, he urged the nation to unite behind Ahmadinejad, calling the result a "divine assessment." There are no independent election monitors in Iran. Mousavi's claims, however, point to some noticeable breaks with past election counting. The tallies from previous elections  time-comsuming paper ballots  began to trickle in hours after polls closed. This time, huge chunks of results  millions at a time  poured in almost immediately from a huge turnout of about 85 percent of Iran's 46.2 million voters. The final outcome: 62.6 percent of the vote to Ahmadinejad and 33.75 for Mousavi, a former prime minister from the 1980s. The U.S. refused to accept Ahmadinejad's claim of a landslide re-election victory said it was looking into allegations of election fraud. U.S. Secretary of State Hillary Rodham Clinton said she hoped the outcome reflects the "genuine will and desire" of Iranian voters. At a joint appearance with Clinton, Canadian Foreign Affairs Minister Lawrence Cannon said his country was "deeply concerned" by reports of irregularities in the election. "The majority of Iranians are certain that the fraud is widespread," said Tehran-based analyst Saeed Leilaz. "It's like taking 10 million votes away from Mousavi and giving them to Ahmadinejad." Whether this is enough to spawn a sustained opposition movement remains an open question. Much depends on how much they are willing to risk. The heartland of Iran's liberal ranks is the educated and relatively affluent districts of north Tehran. It's also the showcase for the gains in social freedoms that began with the election of President Mohammad Khatami in 1997: makeup, Internet cafes, head scarves that barely cover hair and satellite dishes that are technically illegal but common. The ruling clerics tolerate all that to a point  part of a tacit arrangement that the liberties stay as long as reformists remain politically meek. A real protest movement could threaten their coveted Western-looking lifestyle and risk a brutal response from groups vowing to defend the Islamic system. The political chief of the powerful Revolutionary Guard has warned it would crush any "revolution" against the Islamic regime by Mousavi's "green movement"  drawing parallels to the "velvet revolution" of 1989 in then-Czechoslovakia. Authorities also called foreign journalists with visas to cover the elections, including members of The Associated Press, and told them they should prepare to leave the country. Italian state TV RAI said one of its crews was caught in the clashes in front Mousavi's headquarters. Their Iranian interpreter was beaten with clubs by riot police and officers confiscated the cameraman's tapes, the station said. "The massive demonstrations of police and army presence on the streets was designed to show that they were quite ready to kill protesters if they had to in order to impose order," said Patrick Clawson, deputy director at the Washington Institute for Near East Policy. "On the whole, these guys in north Tehran who are terribly upset about what is happening are not ready to die." Hadi Ghaemi, spokesman for the International Campaign for Human Rights in Iran, denounced the outcome as "a Tehran Tiananmen"  a reference to China's brutal 1989 crackdown on pro-democracy activists  and urged the international community not to recognize the result. There were also protests by Mousavi supporters in the southern city of Ahvaz in the oil-rich province of Khuzestan who shouted, "Mousavi, take our votes back!" witnesses said. Mousavi called on his backers to avoid violence, but he is still talking tough about pressing his claims of election fraud. He charges the polls early but has not fully outlined all of his fraud allegations. Unlike his ally Khatami, Mousavi is a hardened political veteran who led the country during the grim years of the 1980-88 war with Iraq. He also could join forces with the powerful political patriarch Heshemi Rafsanjani, who strongly opposed Ahmadinejad's re-election during the intense monthlong campaign. Amjad Atallah, a Washington-based regional analyst, called it "one of the most existential moments" in Iran since 1979 Islamic Revolution. "You can't overstate how important what is happening now is for Iran," he said. In Tehran, several Ahmadinejad supporters cruised the streets at dawn waving Iranian flags out of car windows and shouting "Mousavi is dead!" They were quickly overwhelmed by the Mousavi backers. The protesters  some hiding their faces with masks  still wandered the streets after nightfall as some fires still burned. The pungent smell of burning rubber and smoldering trash lingered in some parts of the city. Hundreds of anti-riot police blocked the streets leading to Tehran University's dormitory, home to thousands of students and the site of the 1999 student riots that marked the biggest disturbances in post-revolution Iran. University exams nationwide were postponed until next month. Oddly, normal life was interspersed with the anger. People continued shopping and stores remained open. With the Internet and mobile texting down, some Iranians turned to Twitter to voice their views. "Very disappointed with Iran elections," said one entry. "Apparently still a backward regressive nation." Another: "Elections in Iran: stayed tuned as it gets interesting (& maybe scary)." Ahmadinejad addressed a crowd in Tehran, but did not mention the unrest, saying only "a new era has begun in the history of the Iranian nation." But there were no hints of any new policy shifts on key international issues such as Iran's standoff over its nuclear program and the offer by President Barack Obama to open dialogue after a nearly 30-year diplomatic estrangement. All high-level decisions are controlled by the ruling theocracy.